The included 1.3 Megapixel Color Camera outputs high-quality 1280 X 1024 live imaging which treats users to crisp, clear, detailed color images on your computer's monitor, with zero hassle. With the powerful Motic Images Plus package, the user is able to take still image snapshots, perform rapid live image capture, written annotation, advanced linear and geometric measuring, voiceover capability and a wide array of additional imaging enhancement capabilities. The Articulating Arm Boom Stand with Clamp is ideal for users who frequently need to observe objects that are too large or irregularly shaped to be studied with a conventional microscope stands. 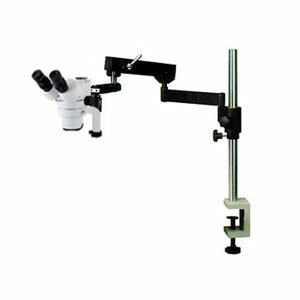 The extending arm provides users with virtually unlimited capabilities for angling and positioning the microscope head, including 360° of free revolution in the horizontal direction. Add to that the flexibility of the clamp base and you've got a microscope that can attach to practically any solid surface and accommodate samples of virtually any size and shape.